What is Opposition Reflex and Why Should I Care? Have you ever heard of opposition reflex? Maybe you’ve heard of the term but you don’t really understand how it affects dog training in a practical sense. I’ll give you a hint, you might experience it every time you take your dog for a walk. Opposition reflex was discovered by Ivan Pavlov, the physiologist who also discovered classical conditioning through his experiments with dogs. It’s a reflex that occurs when a dog feels some type of physical pressure and it stems from their predatory instinct to fight, flight or freeze. To put it simpler, when a dog feels physical pressure, they oppose the pressure with counter pressure. You may not realize it, but you’re already very familiar with opposition reflex because us humans have it too. If someone were to lean on you, you’re likely to lean or push back or if someone pulled you towards them, you would likely pull away. That’s opposition reflex and our dogs react the very same way. 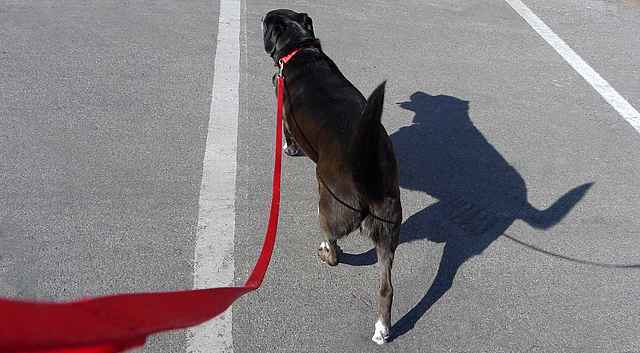 One of the most common examples of opposition reflex is when a dog pulls on the leash while walking. Although there could be a few other factors involved with why dogs pull, if you pull back on the leash, they will generally pull even harder in the opposite direction. This is truly a battle of opposition reflex between dog and human. If you’ve ever tried to push your dog into a down position by putting pressure on their shoulders, you probably noticed how difficult it is as they resist against the pressure and refuse to lower themselves to the ground. Does your dog lean against you sometimes? When you try to push back, they normally lean even harder. Pushing a dog from behind rarely works. For example, if I try to push Haley outside for a potty break when she hesitates at the door, she always backs up instead of moving forward. Why Should You Care About Opposition Reflex? First, it’s beneficial to understand the reflex so you know why your dog might be resisting you at times or pulling on the leash. When we physically force a dog to do something while they’re resisting (rather than using an incentive), it may break the trust and bond we have with our dog and it can cause them to oppose us more often. That can make training even more challenging and frustrating. Another reason to care about opposition reflex is that it’s possible to reduce the level of the reflex in dogs. This would be nearly impossible with most wild animals as they have very strong opposition reflexes, but domesticated dogs can often be conditioned to respond or yield to light pressure through positive reinforcement training. Here’s an example. I’ve trained Haley to turn or change directions while walking on the leash by giving her very light pressure on the leash combined with the command “This Way!”. She’s learned to yield to the pressure instead of pulling against it. Finally, opposition reflex can be put to use in positives ways, such as training service dogs to open or pull things. Sledding, cart-pulling and skijoring dogs rely on the reflex to do their jobs. Even a spirited game of tug-of-war with your pup is a positive way to use their opposition reflex. One of the most frustrating issues dog owners complain about is they can’t stop their dogs from pulling on the leash. 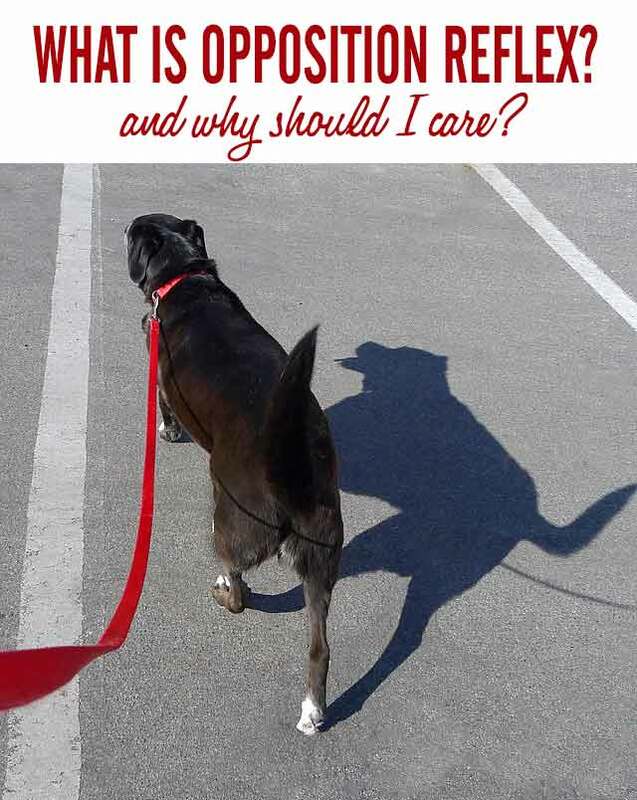 Yep, that’s definitely something I can relate to with Haley, so I’ll be tackling that topic in my next post, Is Your Dog Always Pulling on the Leash? 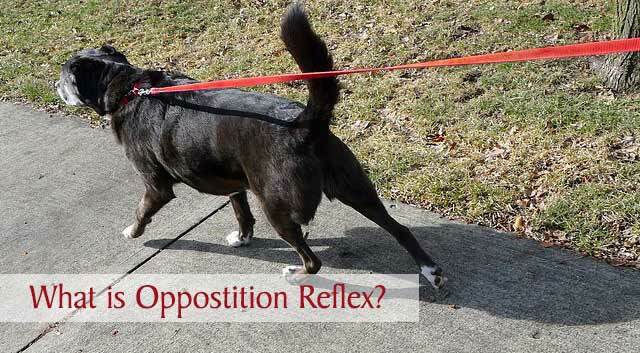 What examples of opposition reflex can you relate to with your dog? Share your thoughts and ideas with us! Very interesting. Ruby pulls a bit on the leash, too. She’s not a super strong dog so it’s not a big deal, but I definitely have experienced the opposition reflex (never knew the word for it). Looking forward to your post next week. Thank you! It’s much easier to manage a pulling dog when they’re small like Ruby, right? She’s just so darn cute too! That is really interesting. We know of it, but haven’t thought much about it. Sometimes I won’t go into the down position and you are right, if Mom tries to force it, it doesn’t work, but if she is patient and works with me it does. I’ve even tried to move Haley’s legs so she would go into a down position and that’s pretty hard too, lol! I’m glad you have a patient and loving mom, you’re a lucky girl, Emma. ? Boy do we ever know about opposition reflex! I have resorted back to the harness, which Chops does NOt like but he is getting used to it again. It sure beats the gagging and fighting for breath. I’m speaking of him although I do some panting…and I’m not having to run to keep up. He doesn’t know it yet but he is looking forward to next week’s post. Btw, he has lost 3.2 since the thyroid is under control. Yea! That’s awesome, Sharon! I can’t believe how much energy he has now and the weight loss is fantastic. He’s got to be a pretty happy boy now that he’s feeling so much better. ? Very good and interesting post! I have never heard much about this topic before. Thanks so much, I’m glad you enjoyed the post today! Hershey was a fierce walk puller until got her a harness that I can clip the leash to the front. Now she’s so used to not pulling that she walks pretty well just with her collar. Marsha and Graham pull too, so I’ll need to get them front attaching harnesses as well. They sure do get used to pulling if they get to move forward and get what they want. It’s great that Hershey has also learned to not pull after wearing the front-clipping harness for awhile. Isn’t it nice that there are so many options now with harnesses and gentle leader type collars? Interesting. I had no idea there is an actual name for it. Bunk’s got the game all figured out, doesn’t he? ? What a timely post. The other day Jax was pulling me around the block like a kite. I remembered using a “gentle lead” with Leo and since I’ve started using it with Jaxson all the pulling has stopped #thankyouJesus I enjoyed reading about Opposition Reflex and look forward to reading about leash pulling. Gentle leaders and the new harnesses sure beat the old days of only having a few options, just flat collars and choker chain collars. When I was a kid, we had a dalmatian and my parents bought a choke collar for him because he pulled so hard. That still didn’t prevent him from dragging us kids on our bellies around the neighborhood, haha! Thanks, I hope you’re having a fantastic WW! I hadn’t thought of this as a reflex before! My best example is Richie putting on what I call the “terrier brakes” if he’s sniffing something and I tug on the leash for him to follow me. If I relax the pressure and happily call him to come “this way,” he usually complies. Exactly! ? You’ve mastered finding an alternative to fighting against Richie’s opposition reflex, Cathlin. I love your term “terrier brakes”, lol! This was very helpful information. My instinct is to tug on the leash and my puppy does the same. I’m going to try using words and treats as incentive. I’m so glad you found the article helpful, Sharon. The concept has always been a little abstract to me until I realized that we humans have the same reflex. Aw, thank you for that nice compliment, Lindsay! I’ve not seen this described in such a clear way before. Good job! And I agree. I find that cookies work better than leash pops in getting my dogs to do the things I want them to do. They are happier, and I am too, when we’re all doing what we want to do and not what we HAVE to do. That’s a smart way to think about it, Jean. With cookies or the right motivation, you can usually make a dog want to do what you want them to do too. Great topic and so interesting. Jack has learned to walk superbly on the leash – Maggie not so much as her fearfulness makes this oppositional pull even stronger! I had to work with Haley’s fear issues when she was younger and you’re right, fear plays a role and definitely makes it more challenging to help them to not pull on the leash. I’m glad Jack is a model pup for loose leash walking. ? This is really interesting. Our Golden Retriever was the world’s worst leaner! If you tried to lean back, he could just push your over. LOL! That’s interesting, M.K. My sister’s golden retriever was a leaner too. I wonder if certain breeds are more likely to have some of these traits. Such a great and informative topic! Thanks so much and Happy WW to you! Yup. Learning about Opposition Reflex was the final shove, so to speak, I needed to become a 100% positive reinforcement trainer. Pushing my resisting dog into a down or pulling his legs out from under him seemed cruel. And I was right! 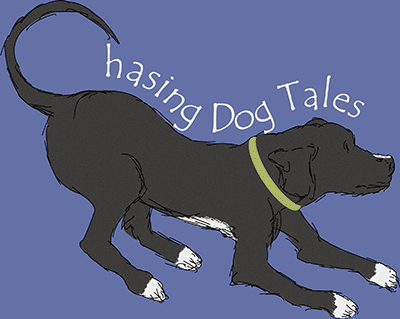 Yanking back on a loose leash is just as counterproductive. I have trained all three dogs to walk nicely on a leash with three different force free methods thanks to what I learned. I am glad you wrote this plain English post about the science behind force free bonding with our dogs! That’s fantastic! I love what you mentioned about force free bonding because sometimes I think people don’t realize how much trust and bonding play a role in training and the overall relationship we have with our dogs. Rita is mostly pretty good about walking with a loose leash – the best dog we’ve had with that actually. Our last dog was probably part husky or sled dog of some sort. That girl could hunker down and pull! It was great when we were hiking and I needed help getting up a big mountain 🙂 but for everyday walking in the street, we ended up getting her a Happy Walker harness (I think that’s what it was called…) and she did really well with that. I had to laugh about your husky girl pulling you up hills, lol! There have been times that I didn’t mind Haley pulling me too when we were climbing hills. I’ve been using it to train Mr. N to pull things open. He can open cupboard doors using a tug. If he was bigger, I’d teach him how to get a beer but he isn’t strong enough to open the fridge! Mr. N is so talented! I’m thinking he could handle the task if you had a mini-frig stocked with cold beer, lol! Very interesting, my dogs do this and never correlated what it was or why. Yeah, it’s funny when you actually think about all the different ways they use the reflex. I guess we’re lucky they’re so domesticated and pretty cooperative most of the time. Well Lord, I adopted the Queen of Stubborn. She opposes me in just about everything. LOL She is super good on leash, rarely pulling but only when she is out by herself. If Sampson is with us, she pulls like a sled dog. Typically she does respond to light pressure on the leash and me indicating what I want her to do. I can’t wait to read next week’s post! Maybe Delilah should be called the Queen of Opposition, haha! But then we wouldn’t have all those great stories that keep us entertained. Haley pulls a lot more too if I walk with another dog. It must be a competitive thing. That is pretty amazing, isn’t it? That reminds me of the first time I tried to put a collar and leash on our old cat, lol! I had to laugh when you mentioned Buzz and Missy leaning on you. It just occurred to me that maybe Haley uses a type of opposition reflex when she’s fallen asleep on the bed and we try to move her. It’s like she tries to make herself very heavy so it’s so much harder to lift her up, lol! So interesting to read. I am learning more about training with Cocoa and dealing with some leash aggression (I think that is what I would call it) now. I wrote about it today. It is so good to remember that we have a trust relationship and we do not want to do anything to hurt the trust. Oh no, I’m sorry to hear about Cocoa and the leash aggression. I’ll head over to check out your post. I love what you said about making it fun and getting Happy interested in other things. That’s such a great way to strengthen bonding too! That is so interesting! I had never heard of this, but it all makes perfect sense. I think being aware of it can go a long way towards helping us to work with our dogs better! It is really interesting, especially the training strategies that use opposition reflex to train in positive ways. That’s something I want to learn more about.